Rediff.com » Sports » EPL: City to dismiss Mancini and bring in Pellegrini? Malaga coach Manuel Pellegrini will meet Manchester City authorities on Thursday to finalise his joining date at the club, following manager Roberto Mancini’s expected sacking. Etihad bosses are determined to replace Mancini with Pellegrini, especially after City’s defeat to Wigan Athletic in the Barclays Premier League, the Mirror reports. Mancini could be on his way out in the next 48 hours. 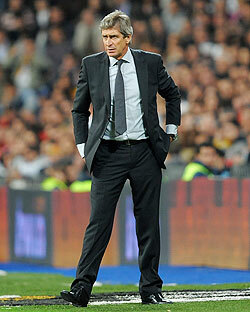 City authorities have reportedly decided that Mancini has played his part, and needs to make way for Pellegrini. They have said that Mancini will not accompany the squad during the tour of the United States next season. There are speculations that there might be a break-clause in Mancini’s contract with City, which runs until 2017, and a possible pay-off of a year’s wages. Mancini has been earning seven million pounds a year from the club.